This is a stunningly simple recipe, either for a light meal or as a starter. We include two variations. 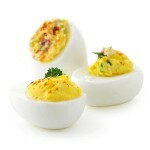 Cut the hard-boiled eggs in half lengthways. Take out the yolk, place it in a small dish and break up with a fork. Mix the crab meat (or tuna) with a small amount of mayonnaise seasoned with sea-salt and black pepper. Spoon generously into the egg whites. Sprinkle the yolk over the top and garnish with chopped parsley. We’ve just tried a new variation of this using Smoked Haddock in a creamy béchamel. All you need to do is to poach the haddock in milk and then flake it. Fill your eggs with the mixture. It is also very good!